Air horns are usually made to be used on boats, at sporting events and in other situations where a very loud, far carrying noise is required. 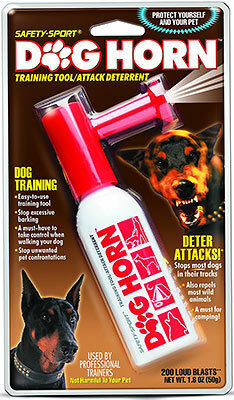 But there’s another reason that people are now buying and using air horns – to stop a dog from barking excessively. They are also increasingly being used for personal safety, including to scare off bears, coyotes and other wildlife, and for aggressive or trespassing dogs. Some people like to take them when out talking their dog, for these very reasons. They work by interrupting the barking or other unwanted behaviour thanks to a very startling, loud and abrubt noise. 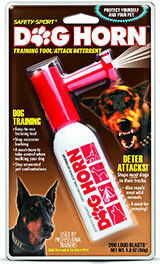 Using an air horn for barking dogs is an option people might consider when other methods have failed. So if you’re considering an air horn for dogs as a last resort – or maybe even a first option if you’ve heard how well they can work – for a barking problem (whether it’s your own dog or a neighbors’), there’s a few things you should know before buying one. After all, a blaring horn is not something that most of us buy on a regular basis. To save you time, I’ve done many hours of research and am happy to present my findings in this big guide! There are two main types of air horns to consider. The best ones have a replaceable, usually stainless steel air canister attached to the horn. This provides enough air pressure to make the airhorn emit a very loud sound. Cheaper, less powerful, less durable and nowhere near as loud are the budget airhorns which have a simple pump mechanism that allows you to manually pump air into the chamber. These can work well if your intended target is close or if you think you won’t be using it too often, as manual pump air horns are often quite cheaply built. The upside of the manual horns is that they don’t run out of blasts like the cylinder air horns so there’s no refills to buy. 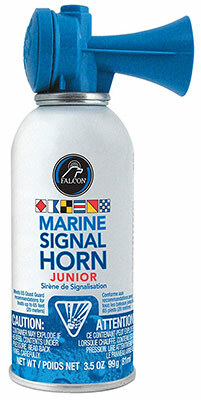 If you want something a bit more robust, you’ll probably want to invest a few dollars more in a much louder, more durable marine or sports style horn with replaceable sealed canisters. Remember these are made to be heard from offshore and across large sporting fields, so are the ultimate choice if you want the best distance and volume ability, especially if the barking dog is some distance away. 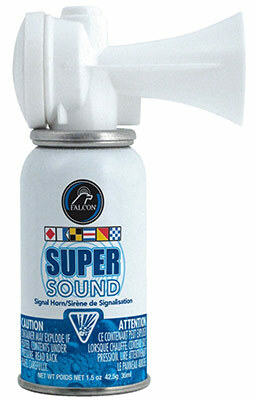 Real marine-style air horns are made of a stainless steel cylinder containing compressed air, which screws on to the provided trumpet (the horn part) to form an airtight seal. When you buy an air horn, the two parts are separate and you need to screw the trumpet on to their air cylinder. This is to make sure that air pressure isn’t lost before you receive the product. Good quality air horns will be easy to assemble (taking just seconds), with a solid seal being formed once you attach the trumpet part to the can. If any hissing is noticed, that mean’s there’s a leak and the horn isn’t properly attached. To prevent losing all the air through a leak the trumpet MUST be attached properly so that the cylinder is well sealed. This also ensures that your horn will work to its maximum capacity and volume! 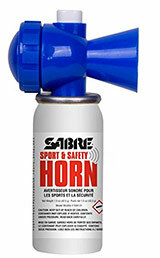 The only horn made specifically for dogs – the aptly named Dog Horn made by Safety Sport is small and convenient. It’s a real personal air horn that doesn’t have the bulk of some of the others in this guide. Using it for controlling excessive barking is just one purpose for this little hand size horn, but it’s the one we’ll focus mostly on here. While the horn is a very convenient size to hold in your hand, there’s also an optional holster you can purchase so you can easily store it away but have very quick access to it at a second’s notice. The Dog Horn has 2 different sounds it can produce when you activate it. There’s either a sharp very loud sound (similar to a regular air horn) by default which is the one most people will want to use, or a high pitched whistle/hissing sound when the trumpet is removed. You should try both options to see which one gets the desired reaction from the target dog. There are a few buying options for the Dog Horn. If you only plan to use it at home to curb barking, you most likely won’t have much interest in the holster. You will get around 200 blasts of sound from each horn before it needs replacing. So it’s lifespan will depend on how much of a barking problem you’re dealing with; but there is a six pack purchase option available too if you think you’ll be making much use of this little dog horn! Depsite the relatively small size of the Dog Horn compared with most other air horns, it doesn’t slack off in the volume department. Most people would describe it as being very loud, which it needs to be if it’s going to work to get an immediate reaction from a dog to stop the unwanted behavior. After using the Dog Horn a few times you learn how to push the button to get the volume and duration of sound you want – there’s no need to hold the button down, but instead just give it a quick short tap to activate a quick startling burst of sound. Comes in three sizes: Mini which is 1.5oz and would fit in a pocket, Small which is 3.5oz, and the largest capacity being 8oz. Individual refills are available from SeaSense. Cons: None to speak of. Although not a con, this isn’t a hugely compact air horn at around 7.5″ in height, but it’s still small enough to be able to conceal well if you need to. There’s nothing fancy about this air horn. It’s just a good quality, standard design that does exactly what it’s meant to. 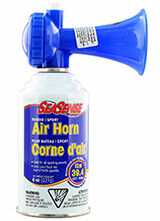 This air horn comes in 2 sizes: 3.5oz and 8oz cylinder capacities. 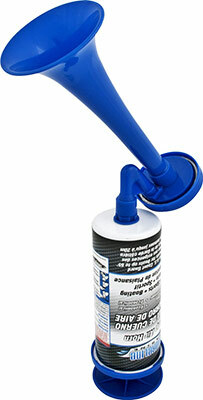 It is made in the USA and is claimed to be the “loudest and most effective air horn available”. That’s a big claim to make, and you’re probably thinking this isn’t a huge deal if you just want to use it to stop dogs barking, or to stop roaming dogs coming on to your property. That’s certainly true, because all of the air horns listed here are loud. But if you want the best, just because (or you might have a specific reason! ), this is a good candidate. You’ll have to be prepared to pay a bit more to find out what the potentially loudest air horn sounds like though, as the K3 is priced a level above the other brands and products reviewed here. One of the reasons this air horn is so popular is because of the reassuring 100% satisfaction guarantee straight from the manufacturer. Pros: Excellent quality. Possibly the loudest air horn on the market. Cons: Look at other options if you’re on a lower budget. This much smaller horn (Falcon calls it a mini horn) still gives out an exceptionally loud blast. So don’t be deceived by its compact size. Approximate distance that the horn sound will carry is half a mile over land, and this small one is probably going to be the choice for people wanting to use it in more densely populated areas – it is certainly still extremely loud and will be heard by your neighbors and their dogs! Refills can be bought once you’ve used up the first cylinder. Pros: Like all Falcon air horns, comes with a no-break guarantee. Despite the fact it’s called the Junior, this horn from Falcon is larger (more than twice the capacity) than their Super Sound and Aqua Blast models. If you think you’ll be using an air horn regularly, the extra size will be a benefit. Although the decibel volume rating isn’t indicated, needless to say that it exceeds the 112dB of the Falcon Super Sound, which is already a very loud device. Refill cylinders are available, made specifically for the Junior model. Pros: No-break guarantee, very loud. The Aqua Blast wasn’t included in the comparison table above as it’s basically the same as the Falcon Super Sound air horn but with a slightly different design. It’s designed to attach to a flotation device out on the water, and can be submerged in water and still work. 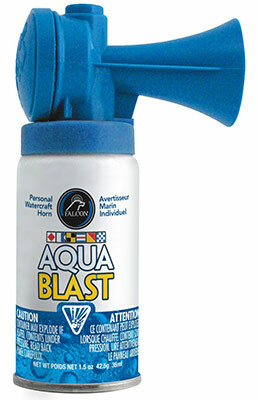 This is probably not going to be a concern for 99% of people wanting to use an air horn to deter dogs, but if you also plan to use one on a boat or other marine activity then you can’t go past the Aqua Blast. Depending on where you live and what else you might want to use it for, this is a feature to take note of as it’s what makes this one different from other Falcon horns. The sound of this horn is described as a shrill, piercing blast. It is extremely loud – some people recommend using ear protection while you use it (although this can go for all air horns, especially if you’re a sensible person!). Refills are available from Falcon, made especially for the Aqua Blast. This isn’t a horn that is going to go off accidentally which can be a problem with some products. The button requires a pretty firm push which is what most people prefer as you don’t want it going off unintentionally indoors or before you’re in position to set it off, scaring the beejeezus out of you and anyone nearby. Unfortnately some products can suffer from this potential problem, but not the Shoreline air horn. If you live in cold climate location then the potential unreliablility during colder weather can be an issue with the Shoreline, so in those cases you might want to look at the K3 or one of the Falcon air horns instead. Otherwise, this is a loud and powerful air horn that is certainly going to be heard by dogs (and people) within about a half mile distance from wherever you use it. Pros: Needs a good amount of force on the button to set it off, so not prone to accidental blasts like some other air horns. Very loud. Cons: Cylinder can become cold if used too long. Can be unreliable in cold temperatures. 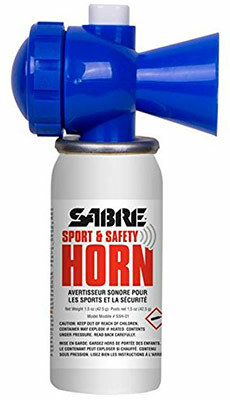 Unlike with most air horns, Sabre actually estimates how many blasts you’ll get out of each cylinder: for this 1.5oz horn, it’s rated at 38 blasts with each horn sound lasting 1 second. 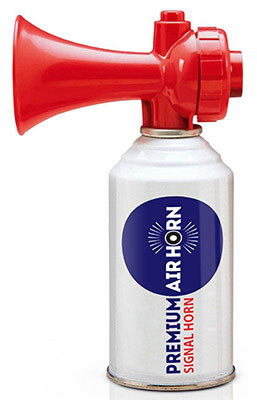 It’s been noted that the tone of this air horn has more of a high pitch – an extremely loud high pitch, whereas some other air horns have a slightly deeper sound. Pros: Small and compact. Extremely loud for its size. Cons: No safety or lock mechanism so can be easy to accidentally press the button when you don’t intend to. Rated for 38 blasts but might not always reach that number. Cylinder becomes quite cold when used for more than a minute or two (not likely to be an issue for a one-off blast for a barking dog). The obvious benefit of hand pump air horns is they don’t run out or require a refill. Manual air horns just run on your good old hand power alone. The downsides are they (usually) aren’t as loud as compressed air canister horns as you would expect, and you need to get a high quality one if you want it to last long and perform decently. There are no decibel ratings or distance ratings for this manual hand pump horn. It simply isn’t sophisticated enough to worry about – it’s just a simple device that is easy and fast to use. It is of course still loud enough to be heard by any barking dogs (and the neighbors) in most urban environments, so you’ll still need to use it with caution because it will grab attention whether you want it to or not! 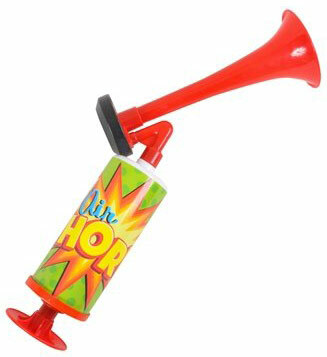 If you’re on a desperately small budget, there’s not much to lose by giving this pump horn a try. Just don’t expect spectacular performance or quality. Never runs out of blasts but unlikely to have a long life due to low quality. 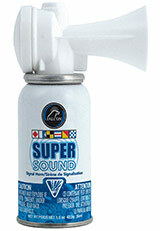 High pitched sound – think bicycle horn – lacking the force and depth of real air horns. Blasts are short as there’s no way to sustain the sound. This is one of the better quality hand pump horns you’ll find; significantly better than the Super Blast in both build quality and sound. This product is made in China but is still one of the best built manual pump air horns out there. 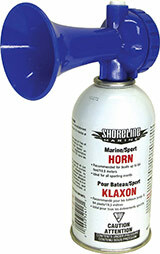 Shoreline Marine are well known for quality products and this is about as good as it gets for this type of air horn. If you need more power, you’ll want to look at the push button cylinder products. Pros: Very loud, higher quality than most hand pump horns with a metal canister instead of plastic (the horn itself is plastic though). Blasts can last several seconds if you hold the pump in. Cons: Still limited by the fact it’s a pump air horn. You have barking dogs to quieten, so I’m not going to go into deep scientific detail about how air horns work. As long as they do actually work as intended, that’s all we care about. The most basic explanation about how these nifty devices operate is that they simply take advantage of compressed air that is pushed through a valve and out through a trumpet. Some air horns use an aerosol propellant in the cylinder. All products listed on this site are non-flammable and comply with US safety regulations. 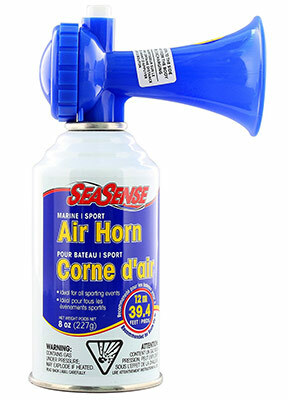 The best air horns will be totally sealed with no leakage in the air chamber, which results in maximum volume. Stainless steel cylinder air horns, like many of the ones listed on this page, provide the most air pressure and thus the loudest and furthest carrying blasts. Manual hand pump horns obviously don’t provide that same amount of air pressure, so while they can certainly be loud, they aren’t as robust or powerful as a real air horn because they’re relying on your hand power to push the air from the chamber up through the valve. Cylinder style air horns on the other hand, usually just require you to push a button and the air is automatically pushed out at full force. The best quality air horns will not leak air out, or only do so at the smallest unnoticeable levels, once the horn has been attached to the canister. Cheaper products often aren’t as tightly sealed and you can find that you get less use out of each canister due to leaks or in the worst case, the horn won’t sound at all. The maximum decibels (dB) that an air horn emits refers to the volume of sound. The dB rating isn’t always listed on a product though, and instead a manufacturer might just state how far the sound can carry (e.g. one mile across water). As a guide, some the louder air horns I’ve listed here can have a decible rating of over 120dB. How does this compare to other sounds you’re familiar with? Here’s a short list of a few common “loud sounds” that could give you a closer idea of what a 120dB air horn might sound like in terms of volume. Remember, you will be blowing the air horn only an arm’s length from your ears at most, so keep that in mind when making a comparison! 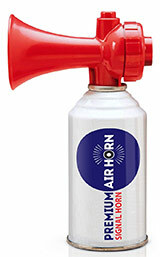 Keeping things in perspective – a quality air horn is certainly very loud for the few seconds you use it. Which is of course the very reason so many people have worked out that it’s often effective against problem dog barking. Startling the dog and completely interrupting the barking is the aim of the game. How far away can the horn be heard? And how far do you want it to be audible? On land you’ll potentially have trees, buildings, fences and other things that can act as sound dampeners, so a horn that’s rated for a mile of audible distance on water might be heard for half a mile on land – this is still an exceptionally long distance for urban areas. Especially if you are planning to use it to stop the neighbor’s dog barking. Just keep in mind that the dog next door likely won’t be the only one to hear your air horn – for some people this won’t be an issue, and it really depends on where you live and whether you care if your horn-tooting is heard by other neighbors. For people who have used air horns to quiet a barking dog, many say it’s that the benefits outweigh any short term negatives. 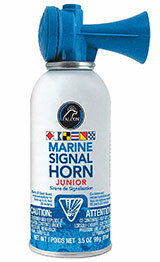 As mentioned a few times in this guide, marine style hand held air horns normally have a stainless steel canister containing the compressed air and propellant, with a threaded top which you attach the supplied trumpet or horn to. This part is usually made of a tough plastic. Durability and reliability of an air horn will depend a lot on the build quality and specifically, how well the horn part actually attaches to the canister to achieve a complete seal so that no leaks can occur. With this in mind, it’s obvious how and why a top quality air horn is what you want to get – and not one that might leak out before you use it, or after only a few blasts. Air horns are loud – this means you can be certain it will be heard by its intended target. Whether that be the neighbors’ dog or your own dog; the fact is, when you blast that horn, it can’t be ignored by anyone. And they provide an option when other options have run out – you might have tried talking to the neighbor and they have had no interest in controlling their barking dog(s). People who have resorted to air horns often note that it startles the owners as much as the dogs, and in some cases can even lead to people finally becoming aware that their dog’s barking is causing a problem for surrounding people, leading to a change in behavior of both dog and human owner so they can avoid being exposed to the airhorn. Of course, you don’t want to cause unwanted distress to your neighbors so your own personal situation and environment will determine just how far you can go with this method! Air horns are LOUD – yes, you did read this in the Pros section above. But I’ve also had to add loudness to the cons section, because it’s something that you’ll either love or hate – most likely both! The sheer volume of an air horn is obviously the whole idea of it, it’s just that it can make it uncomfortable to use if you have any neighbors within half a mile (or so) radius who you don’t want to disturb. The good thing is that you generally only use the horn for a few seconds. The downside is if you use it too regularly you might (ironically) find yourself the victim of a noise complaint. It’s all about getting the balance right and it mainly comes down to where you live and the types of people around you who will also hear the horn (and of course, how often you plan to use it). Airhorns are best used in short bursts. The dog will hear it. People will hear it. People will wonder what the heck is going on. And ideally, the barking dog(s) will retreat at the sheer unexpected volume of your air horn. Nobody wants to hear that sound again. That’s what makes air horns work so well for people with dog barking or dog trespassing or security issues – it causes no harm to anyone when used properly; it’s just highly unpleasant which is what makes it so effective as a deterrent. If you’re buying refill cylinders, make sure its the same brand. In most cases, refills of one brand will not fit the trumpet of other brands even if they’re the same size. This is because most cans and horns/trumpets are threaded so they need to be a perfect match with the threaded canister. To refill, just unscrew the top section (the horn) from the cylinder, and attach a refill cylinder of the appropriate size/model. Common sense needs to be adhered to if you want to use an air horn. Even the manual pump devices can be extremely loud, and certainly should never be directed at someone at close range. Buying an air horn is a small financial outlay, with more people choosing this option to quieten a barking dog when other methods have failed. The low cost of even the best quality air horns make it a viable option for most people who just want to give it a try to find out if this could indeed be something to excessive barking, either of a neighbor’s dogs or of your own in the backyard.